We are Gordon Whitbeck and Elvia Gignoux and we are both life long residents of Salisbury. The farm has been in Gordon's family since 1916, for four generations. Charles Nelson, followed by his son Albert, farmed here until the late sixties. In 1944 my grandmother married Albert and my mother and her siblings moved to the farm. The farm was primarily a dairy but also raised broiler chickens for O'Hara's on Twin Lakes in the forties. After my grandfather retired he and my grandmother continued to live here and leased the farm which continued as an active dairy. After he passed away my parents moved into the farmhouse. 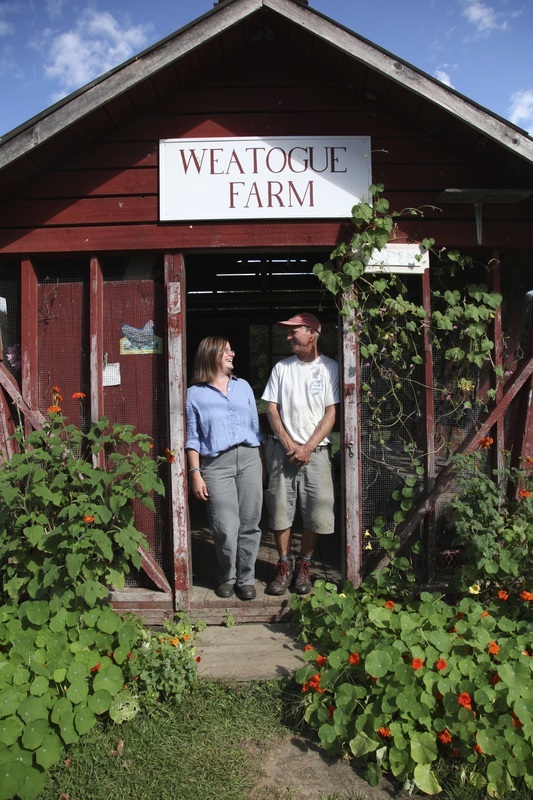 In 1990 I plowed up a few acres and started Weatogue Farm, a certified organic vegetable farm. I sold at farmer's markets, restaurants, co-ops, supermarkets and also at my farm stand here on Weatogue Road. In 2002 I decided to work full time off the farm and closed the stand. In 2011 Elvia and I decided to re-open the farm stand and we moved to the farm that summer. While the farm is no longer certified organic, we still follow organic growing practices. The farm primarily produces vegetables, flowers, eggs, and hay. We sell only what we grow so the selection is seasonal. We have a spring plant sale starting May 19th continuing through early June. At the sale we sell vegetable, herb and flower plants. We have a small flock of sheep and sell fall lambs for the freezer. We also sell note cards and calendars featuring photographs of the farm. The farm stand is self serve and open daily. We only sell what we grow so the selection is seasonal.